The way Bloomberg is going, he’d be better off setting a billion dollars on fire than running for President. But please do anyway, Mike. I still say there is no way Bloomy wins and that he hurts Dems if he does, but since he’s thinking of running for President (according to news reports), I thought I’d write about this stupid story. New York is moving closer to becoming the east coast San Francisco. Mayor Bloomberg’s office is thinking about requiring anyone taking pictures, moving or still, to get a permit from the city AND carry a million dollar liability insurance policy, if they stand in one “area” for more than 30 minutes. We couldn’t make this up. Well, we could, but we’re not. It’s so absurd, but it’s true. Code word: anticipate. They could write this so it only impacts Hollywood film crews and fashion magazine shoots, but they decided not to. Why? So they can fine the hell out of tourists if they want! Geez, this is New York, Bloomberg’s New York. That’s what they do! Ban Smoking, ban trans-fats, ban head phones in cross-walks, ban taking pictures without paying. They want to run your life and they love your money! We do to, we just don’t use the power of government to steal if from you. With the deadline for second quarter fund raising looming, the campaigns of two Johns could face serious questions to their viability, while Clinton, Obama, Giuliani and Romney are all expected to post totals similar to, if not greater than, their first quarter numbers. “If you’re not showing the ability to raise substantial amounts and start to pile up cash by this point, it’s increasingly difficult to see how a candidate is going to be able to win the nomination,” said Anthony Corrado, a professor of government at Colby College in Waterville, Maine. McCain, more than any other candidate, can’t afford a fundraising dip, said Rogan Kersh, associate dean of New York University’s Wagner School of Public Service. After the first quarter, McCain overhauled his fundraising operation, though he continues to struggle with donors and has dropped steadily in national polls. The key among three other Democrats — New Mexico Governor Richardson and Senators Dodd of Connecticut and Biden of Delaware — will be who raises more than the others and who comes close to or eclipses Edwards. It cannot possibly be a good sign for Edwards that Bill Richardson has tied him in a recent New Hampshire poll and that Richardson may actually come close to or even overtake Edwards in second quarter fund raising. If you’ve watched any of the Democratic debates you should know that Richardson is the same horse that could be outperformed by Mr. Ed in a debate if given the chance. The Barack Obama campaign told the Associated Press that they expect to total 250,000 contributions before the second quarter fundraising reporting deadline. That would give him more than the impressive number achieved in Q1. The freshman Illinois senator impressed rivals in the first quarter when he reported 104,000 donors, but he surpassed the mark in the second quarter with 138,000 more opening their wallets, the campaign told The Associated Press. The speculation is that his dollar total should be somewhere in the same neighborhood as the $25 million he raised last quarter, which put him neck-and-neck with Hillary. So while the national horserace numbers between Clinton and Obama have remained unchanged during the last quarter, Edwards’ implosion has strategically weakened Senator Clinton’s hold on the nomination. The Clinton campaign wants to neutralize Edwards and to limit the odds of him breaking out with an early win in Iowa. But they don’t want to see Edwards’ campaign totally implode and allow the anti-Hillary forces to rally behind an increasingly powerful Senator Obama. With more than six months before the first polls open in Iowa (a very merry Christmas Caucus anyone? ), and with the level that Clinton and Obama are fundraising, this race could very quickly degenerate into a two-horse match race and not the Derby that some expect. For a wrinkled guy, Fred Thompson has that rosy, fresh scent, if for no other reason than he is not yet actually running for president. Once the reality of his entering the race hits, all those people that want Thompson in the race are likely to suddenly become disillusioned. Good press (as reporters search for ever more candidates in the already overflowing field) will often follow an unofficial candidate right up until he/she officially declares, at which point the attacks begin. Clearly then, the smart thing for Thompson to do would be to hold off declaring until late October of next year, at which point he might stand a chance of winning. Unfortunately for Fred, that can’t happen, so when he announces his presidential run in a couple weeks, he’ll have to answer hard questions about his years of work as a lobbyist. Right now none of Thompson’s past lobbying efforts are in the forefront of the minds of voters, but once his past becomes common knowledge, Fred is going to have some serious problems. Lobbying for a billion-dollar failed nuclear project and for a saving-and-loan bill that helped collapse the industry are, granted, not something most voters cast ballots based on, but on top of those misguided efforts, Thompson was a lobbyist for the horrific Haitian President, Jean-Bertrand Aristide. To refresh unpleasant memories, Aristide, ousted among protests of corruption (among other things), was globally despised for endorsing a sick form of execution where tires, soaked with gasoline, were thrown around a victim’s neck and set on fire. This practice, called “necklacing” was, quite disturbingly, praised by Aristide, who stated, “The burning tire, what a beautiful tool! … It smells good. And wherever you go, you want to smell it.” Even more disturbing, perhaps, is one presidential candidate to-be’s lobbying the White House on Aristide’s behalf. If Rudy and Romney are having a tough time answering questions of social liberalism and flip-flopping, respectively, the cross-examination of Fred Thompson should be the stuff of movies, and without a script, Thompson is going to be faced with the nearly impossible task of maintaining his likable facade. Hillary, eh? Take off, you hoser! Thankfully they can’t vote, but if they could Canadians would cast their votes for Hillary Clinton for President. By a margin of 36 to 12, Hillary beats Rudy, with Obama at 11 and the also-rans coming in around the low single-digits range. Why anyone would conduct a poll of a foreign nation on the election of this country, or the other way around, is beyond me. But since dual citizenship is so easy for Canadians to get here, don’t be surprised when Hillary comes out and says she’s always been a Maple Leafs and Blackhawks fan. Still waiting to see the poll on how the dead in Chicago will vote. In the words of Porky Pig: Th-th-th-that’s all folks! It seems unimaginable, but the fortunes of Senator McCain appear to be going out with a fizzle.Â The word on the street is that his campaign won’t even survive the fall. A poll by Rasmussen Reports last week showed McCain lying joint third with Mitt Romney, the Mormon former governor of Massachussetts, with the support of just 10% of Republican voters. This compared with 28% for Fred Thompson, the former Tennessee senator, and 27% for Rudy Giuliani, New Yorkâ€™s mayor at the time of the September 11 terrorist attacks.Â Another poll in Iowa, a crucial early voting state, put McCain in fifth place behind Mike Hucka-bee, the former governor of Arkansas, with only 6%. Update: McCain says I’ve been smokin’ something a little more than is legal.Â Come on senator, spit it out! Fred Thompson, who is keeping the worst kept secret about his intentions to seek the Republican nomination, apparently won’t need to remain hush-hush about his numerous past romances. Thompson, who has a reputation as quite the charmer, has had a string of exes come out to say how wonderful he is, and that they respect him and support his run at the presidency. Country singer Lorrie Morgan “couldn’t think of a bad word to say” about Fred, claiming he is a “perfect example of chivalry”. Another ex, GOP fundraiser Georgette Mosbacher, claims Thompson’s abilities to charm both traditional and professional women will allow him to beat Hillary Clinton in a head-to-head matchup. Even Thompson’s ex-wife, Sarah Kresnick, is intending to campaign for him. Ex-girlfriends, wives and significant others falling over themselves to sing Fred Thompson’s praises? If nothing else, it is quite the turn around from all the hidden and politically spun stories of the Bill Clinton affairs. The more people who are allowed to vote at once, the more pressure there will be on candidates to use television advertisements, therefore to acquire money, and therefore to court big money donors. Just because we give to the public the right to select who shall be the nominee does not mean that we have avoided the plutocratic exercise of power. As I have indicated several times on this blog – the exercise of power can be subtle. The more pressure you place on candidates to acquire big money, the more power you give political elites to set the national agenda. In other words – political elites will effectively narrow the field of choices for all of us in these schemes by supporting, or refusing to support, candidates. This is why placing Iowa and New Hampshire early in the cycle has a real benefit. This is an opportunity for candidates to build grassroots support via retail politicking. From this activity, they can post some wins and then score some big donors. In this situation you give to Iowa and New Hampshire some of the power to set the agenda. They are empowered to review a whole host of candidates, and decide which are, and which are not, worthy of the broader publics consideration. Of course, the media and the political elites play this role in the current system, too. But, in these alternative schemes, Iowa and New Hampshire would lose what power they have, and essentially all agenda-setting power would accrue to political elites in Washington, D.C., New York City, and Los Angeles. The problem in the last few cycles has been not only that Iowa and New Hampshire set the agenda for the rest of the public – they also effectively made the choice for all. This happened in 2004 and 2000 with the Democrats. I think this year’s schedule might ameliorate much of this problem [which, recall from yesterday, is overrated – Iowa and New Hampshire have only ever effectively chosen the nominees when they act in tandem]. Iowa and New Hampshire come early, but they are almost immediately followed by a majority of the nation. This separation between the early states and Super Tuesday retains Iowa and New Hampshire’s agenda-setting power. They can flag candidates as worthy or unworthy of our attention. Meanwhile, the smallness of the separation means that the race will not end before Super Tuesday happens. With just two weeks between New Hampshire and Super Tuesday – it is unlikely that the competition will fall off because of losses in the Buckeye and Granite States. The public will be able to use the early states as an agenda-setting cue, but will still be able to make a real choice. Jay goes on to evaluate some of the reformist plans being offered, and does a good job of highlighting both their qualities and their question marks. Personally, I think I would prefer something that resembles what are being loosely referred to as the “Delaware Plan” and the “California Plan.” I like the former because it creates a slow build up, so that all candidates could start in small states like Delaware, and finally conclude their campaigns in states like California. By that time, small “retail” states will have “set the agenda” as Jay puts it, and the big money being spent on states like New York would presumably be coming from the coffers of the genuine frontrunners. The so-called California Plan would enable something similar, by randomly grouping big and small states/territories into 10 two-week intervals. This type of schedule could enable candidates to win votes via retail politicking. I think that is precisely its point. However, if the selection of states is random, it is not hard to envision a scenario in which you need lots of money and time simply to fly the jet (Round 1: Delaware, Vermont, Alaska, Hawaii, New Mexico). Thus, this would offer no guarantee of protection for retail politicking. Also, it is naÃ¯ve to think that retail politicking can happen any where at any time. It takes strong grassroots political institutions – strong local parties, strong civic groups, etc. It also takes a public that is willing to dedicate the time and effort to evaluating these candidates in formats that are more personal than the mass media. In my dissertation, I call this the political economy of the electoral campaign. It varies from locale to locale. To think that we can pick up New Hampshire’s method of politics and place it in Mississippi – without creating equally strong political institutions and a culture attuned to retail politics – is not very realistic. What is more, the variable nature of this system will make it so that only rarely will publics be able to engage in retail politics, and therefore no place will be able to retain the political and social institutions necessary for such politics. Also, I find it hard to imagine a contest lasting past four of these ten rounds. Thus, never more than 24% of the public will essentially decide the nominees. The blindness of the scheme offers justice to all states – but justice is not the same as efficiency. One of the criticisms of the current scheme is that only a small segment of the public ever gets a say. This is inefficient, given that the President is a leader of all of us. This system fails to address this inefficiency. So what’s the solution? Perhaps we’ve found it. Shifting the system in order to replicate retail politicking in other small states might not work, or as Jay puts it, might not account for the “political economy” in each state. The front loaded system we’ve created may not be pretty, but it still protects the role played by Iowa and New Hampshire (or at the very least can’t be blamed entirely for diminishing it). Two interesting stories developed yesterday on the popular appeal of Senator Barack Obama. The first of interest was Obama’s base-coddling victory at the “Take Back America” conference in Washington, DC this week. Although the 720 votes cast in this Politico sponsored straw poll fail to serve as a genuine reflection of the senator’s broad electability, it still managed to nicely contrast another brewing Obama story. There is an interesting phenomenon that has arisen over the last few months: a trend of moderate Republicans who want to vote for Barack Obama. It may seem counterintuitive, conservatives supporting a candidate who wants to tax the wealthy and embrace the conventions in the Kyoto Accord, but there is something in Obamaâ€™s message about ridding politics of partisanship that is appealing to these Republicans. He doesnâ€™t carry the baggage of a Hillary Clinton. He is new; he seems authentic â€” although his connection to indicted fund-raiser Tony Rezko has made some previous supporters wonder â€” and he has more gravitas than pretty boy John Edwards. The Republicans who like him may have supported John McCain in the past, but after eight years of the Bush White House they feel they can no longer support the Republican field. The idea of a congressional glasnost â€” a harmonic nonpartisanship in Washington â€” is an Obama goal they endorse. A couple of weeks ago, Andrew Sullivan eloquently observed the difference between Senator Obama and Senator Clinton. Whereas the Clinton machine has all of the traditional Democratic interest groups lined up for her endorsement, Barack Obama appears to be creating a “new” base. While questions linger over the specifics of his policy positions, Americans from all walks of life are coalescing around his message, his attitude and his vitality. In 1980, there were discussions about the development of a “new majority” in America. The Democratic Party that had died with the 1968 convention and the McGovern-Fraser Commission left a vacuum of dealignment for the center of American politics. Many believed Ronald Reagan had the ability to forge that majority. There is a similar energy to the Obama campaign, one that appears ready and willing to grab the torch of a generation and take a new Democratic majority further into the 21st Century. Unfortunately for Obama, it might not take a Reagan-like figure to dethrone the marred leadership we have today. In 1980, The Economist referred to Reagan’s victory as “the election that Watergate postponed.” We might be singing a similar tune in later presidential races, because as of right now, the American public isn’t necessarily looking for a third way. They want another way, one that will bring us resolution on the issue of Iraq. A Democrat will very likely take the White House in 2008. But whether or not that Democrat is the duopoly alternative to what we have now (presumably Clinton), or a fresh face intended to forge a new way (presumably Obama), is yet to be seen. It will be interesting to see if these merging cross-sections of Obama supporters have any real life to them, or if this was simply another example of more media fluff. But if they have any life to them at all, might we one day be referring to an Obama presidency (2012? 2016?) as the election that Iraq postponed? Embrace him or dismiss him, there is one thing that the last few days have proven – New York City Mayor Mike Bloomberg has something to say. Exactly how he says it could have a major impact on the race for the Oval Office. Pundits on all sides have an opinion on Bloomberg, from if he will actually run to what kind of impact he could have on the election. On the day after he capped a campaign-style swing through California by ditching the Republican Party, the media mogul “did little to quiet the fierce speculation about a possible independent presidential bid,” as the Associated Press put it. He temporarily knocked Paris Hilton off the 24-hour news channels â€” and proved he’s a bit of a flirt himself. Needless to say, the punditocracy is in a tizzy, gleefully analyzing how Bloomberg’s billions will transform the already wide-open campaign landscape. But sometimes a flirt is just a flirt. Bloomberg clearly wants to be a player in the 2008 election, but that doesn’t necessarily mean he wants to be a candidate. Still, in announcing his new unaffiliated status, Bloomberg said something that caught my attention: “Any successful elected executive knows that real results are more important than partisan battles, and that good ideas should take precedence over rigid adherence to any particular ideology.” Not that Bloomberg was ever known for a rigid adherence to anything besides his money (he is a billionaire, in case you hadn’t heard), but still he may be onto something. On the electoral map, a Bloomberg candidacy puts almost every state into play. Suddenly, the required winning percentage in each is reduced from 50% plus one to just 34%. Will he run, won’t he run? But more importantly will he run on banning transfat and cigarettes? The fast food and tobacco lobbies may be quivering, but a Bloomberg run up the middle if Hillary Clinton and Fred Thompson are the nominees could make for the wildest presidential election since Theodore Roosevelt’s Bull Moose effort in 1912. Although former Sen. George Allen specifically states he is not yet endorsing Fred Thompson, it doesn’t take a monkey’s uncle to read between the lines. McCainâ€™s position on the immigration debate, or as Allen calls it, â€œthe amnesty bill,â€ disqualifies him for many conservative voters. The former senator added that while ex-Massachusetts Gov. Mitt Romney â€œwill have plenty of money,â€ the belief, real or perceived, that he is a Johnny-come-lately to his current positions on social issues hurts him with many GOPers. â€œIn fact, they are not the same as positions he took a year or so ago,â€ Allen said. Ouch! That last comment has got to sting. Read the rest. Where do I send the check? And do you accept checks not printed on hemp paper? Ralph Nader, the only person to ever get Michael Moore to apologize (to Al Gore for his support of Nader in 2000), is thinking of running again, according the Yeas and Nays column in the Washington Examiner. Ralph, please run. You’ll be such a nut that attracts so many left-wing votes in polls that whomever the Dems nominate will have to run as a split personality, courting moderates and wing-nutroots that is will be like watching Me, Myself and Irene on fast forward. Ralph hinted at a run while speaking at the “Take America Back” conference. It always strikes me as odd the way the Democrats scream that they need to “take our country back!” I’m an American, so are all other conservatives. So what exactly are they taking it back from? Apparently we were invaded at some point by some people who took over a while back and most of us missed it. They’ve let our differences of opinion get personal and turn them into angry, hate-filled balls of human flesh. You see this pointed out on a daily basis by the major networks…wait, never mind. For some time, Ron Paul has been making stateside news for his online prowess, but now his internet popularity has even raised eyebrows overseas. The UK’s Telegraph states that Dr. Paul’s popularity has grown after each Republican debate. Considering the price of his online fame is practically nil relative to the costs of traditional media, it is no wonder that Paul’s staff is confident that he will remain in the race long after the other dark horse candidates. Paul plays well with young (and internet savvy) voters, and unlike some other presidential challengers, most notably John McCain, Ron Paul was met with huge applause during his appearances on The Daily Show and The Colbert Report, Comedy Central‘s pseudo-news programs. The Telegraph likens the Texas Congressman’s run to that of Pat Buchanan in 1996, when Buchanan polled poorly in the early stages, but nearly ended up topping Bob Dole for the Republican nomination. Interesting comparison, though Ron Paul’s vision of small government, especially in social matters, is in many ways diametrically opposed to that of Buchanan’s. In fact, Dr. Paul’s vote against each and every bill he deems unconstitutional has earned him the moniker of “Dr. No” among his fellow members of Congress. Perhaps with his increasingly popular message that less is more, Ron Paul could surprise the establishment and rise into the forefront. Look out, James Bond. Hillary Clinton’s campaign has come up with a clever way to promote the “people’s choice” for her campaign song. Her ripping off the Sopranos is a nice change from her ripping us all off for our tax dollars. That is, however, what she’s running to do. When you watch the video you’ll see Hillary delivers a line just about as convincingly as she does a speech (like she’s addressing a group of 3rd graders). That is probably the main reason she's tanking in South Carolina. Bill, on the other hand, is looking pretty good and relaxed. Props to Johnny Sack for the cameo. Fred Thompson has a statistically insignificant one point advantage over Rudy Giuliani in the latest Rasmussen poll. The latest Rasmussen Reports national telephone survey finds former Tennessee Senator Fred Thompson earning support from 28% of Likely Republican Primary Voters. Former New York City Mayor Rudy Giuliani attracts support from 27%. While Thompsonâ€™s one-point edge is statistically insignificant, it is the first time all year that anybody but Giuliani has been on top in Rasmussen Reports polling. A one point lead is meaningless. But it could be a sign of things to come. Read the rest. 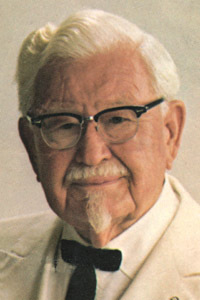 Colonel Sanders’ grandson to shake up the democratic race? Rare is the candidate whose integrity and track record set him or her above the political pack. Rare is the candidate who is able to survive scrutiny by cynics and media alike. Rarer yet is the non-candidate who is shuttled into the arena of presidential contenders, driven by grassroots support. Do not acquiesce to the anointed candidates, bought and paid for, served up by political machines tainted by PAC money and insider agendas. Do not feel obligated to pick between untrustworthy and unbelievable candidates. Do not perpetuate the mere illusion of fairness and legitimacy. For your consideration- Mark J. Green. Become familiar with him. Test his qualifications. Back him as presidential candidate. Sounds intriguing, but what the web site doesn’t tell us is that Mark Green is the grandson if KFC’s Colonel Sanders. Kudos to Mark. We admire him for not riding on his gramp’s coattails. Campaigning in Iowa, Republican money leader Mitt Romney, apparently seeking to attract Bull Moose party voters, emphasized that he would increase the size of the military. Referencing Teddy Roosevelt, the increased military would be the “big stick” with which a President Romney would allegedly speak softly. Considering Romney’s recently released (and far from isolationist) foreign policy plan, Romney may have missed the speaking softly part of TR’s famous message. More surprising than aligning himself to the ideals of the universally respected Roosevelt, Romney went on to speak glowingly of the current (and significantly less popular) president, praising George Bush’s economic policies, Supreme Court appointees, renewable energy policies and even his statesmanship. “Everything he does, he does from the standpoint of what is best for the American people,” Romney said. Praising TR is one thing, but doing the same for a president with a 30% approval rating is aiming very low indeed. Then again, if Mitt could come near come close to 30% in a Republican primary poll, he’d be quite pleased. Can Fred Thompson save the Grand Ol’ Party? A schism has been slowly building over the last few years between the Republican party and its base.Â It began, or at least found its footing in the attempted appointment of Harriet Myers to the Supreme Court.Â It found steam in the Dubai Ports Deal.Â The schism reared its head before the 2006 elections, prompting Republicans to pass a last minute border fence bill.Â A fence, ironically, which still hasn’t been erected. The name generating perhaps the most excitement among Southern Baptists is someone who hasn’t even entered the race yet: Fred Thompson of Tennessee, the actor and former senator. The separation that exists between party elites and its loyal base is being played out in the Southern Baptist Convention. Some Southern Baptists would rather stay out of politics altogether. A small but vocal number of pastors believe the denomination is too cozy with Republicans and too political in general. By flirting with the line separating good citizenship and a grab for power, they say, a denomination already experiencing flat membership risks alienating more people. But is Fred Thompson the answer? The nomination may land with one of the other contenders.Â The GOP may choose to follow the leadership of Rudy Giuliani or the promises of Mitt Romney.Â Whoever the nominee,Â party reunification will be part of the agenda. I’m sorry, but I just do not buy Mitt Romney. He looks presidential, he has some good experience and he has performed well in the debates. But something in my gut just does not sit right about him. Part of the issue with Romney is detailed nicely in an article on ABCnews.com, in which they examine some of the origins of the McCain campaign’s assault on Romney recently. Former Massachusetts Gov. Mitt Romney has long cited a November 2004 meeting with a Harvard stem cell researcher as the moment that changed his long-held stance of supporting abortion rights to his current “pro-life” position opposing legal abortion. Within two months of his epiphany on this issue, Romney appointed to a judgeship a Democrat who was an avowed supporter of abortion rights. In May 2005, Romney also declared his support for a House bill lifting President Bush’s ban on federal funding of embryonic stem cell research — a bill he now said he opposes. Now of course the Romney campaign has spun this information until it has gotten so dizzy that it puked on its own shoes, but I am having a hard time buying it. This still sits as a guy who is running a campaign to win, and not based on his true beliefs, which smacks of the guy currently residing at 1600 Pennsylvania Avenue. How is that working out for us? It was a ridiculous statement. He won. Romney’s case on his change of heart is no where near as ludicrous, but it is every bit as fuzzy and shady. I wonder if it will matter.